When consumers buy commercial cleaning products, we expect them to do one thing: clean! We use a wide array of scents, soaps, detergents, bleaching agents, softeners, scourers, polishes, and specialized cleaners for bathrooms, glass, drains, and ovens to keep our homes sparkling and sweet-smelling. But while the chemicals in cleaners foam, bleach, and disinfect to make our dishes, bathtubs and countertops gleaming and germ-free, many also contribute to indoor air pollution, are poisonous if ingested, and can be harmful if inhaled or touched. In fact, some cleaners are among the most toxic products found in the home. Commerical cleaning products, even those labeled “green” clean faster than soap and water because they contain small amounts of the most powerful grease cutting class of chemicals known as glycol ethers. As more and more consumers are learning about the dangers of products they use in their homes, “green” environmentally friendly options have been introduced such as Clorox Green Works Natural All-Purpose Cleaner, Simple Green, and Purex Natural Elements. Unfortunately the terms “green” and “natural” are nothing more than marketing terms. Most “green” cleaning products like Simple Green are still loaded with glycol ethers. Glycol ether is a generic term for over 30 solvents derived from crude oil, all with different properties, which are used in applications from paints to inks to degreasing agents to cleaning products and perfumes and cosmetics. Reading the labels of the products you buy might not help as many of the dangerous chemicals are not listed. The manufacturers have conveniently lobbied the government to exempt them from this requirement. Manufacturers can omit any ingredient from its label that is considered a secret formula and many of these “secret formulas” are actually toxic and carcinogenic. Phthalates can cause reproductive harm, endocrine disruption, cancer and organ damage. Perfumes can cause headache, sinus problems, asthma and may cause intoxication and addiction. Phosphates can cause widespread environmental damage. Most manufacturers have reduced or eliminated them from laundry products but no action has even been taken on dishwasher detergents. Nonylphenol ethoxlates (NPES) found in laundry products are known to be a potent endocrine disrupter and thought to be the cause of male fish “transforming” into females in waterways around the world. They are already banned in Europe. Formaldehyde found in spray and wick deodorizers is a suspected carcinogen. Volatile organic compounds (VOCs) can cause nose and throat irritation, dizziness and asthma. Petroleum solvents that are found in many floor cleaners may damage mucous membranes. Petroleum solvents that are found in many all-purpose and window cleaners can damage your kidneys, bone marrow, liver and nervous system. Butyl Cello solve, found in many all-purpose and window cleaners, may damage your kidneys, bone marrow, liver and nervous system. Ammonia, Chlorine, and Ethanolamine’s are known to be an irritant to skin, eyes and lungs. Sodium Lauryl Sulfate and its cousin, Sodium Lauretha Sulfate, are commonly found in shampoos, detergents, soaps, and toothpaste. Both are not only a skin and eye irritant but both can potentially cause cancer. Most cleaners don’t list ingredients, but you can learn something about a product’s hazards by reading its label. Most labels bear a signal word, such as Danger, Warning or Caution, that provides some indication of a product’s toxicity. 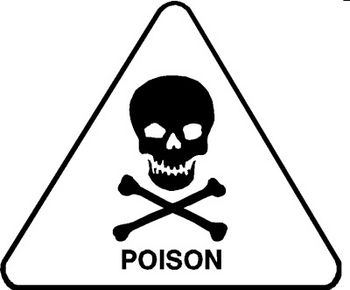 Products labeled Danger or Poison are typically most hazardous; those bearing a Warning label are moderately hazardous, and formulas with a Caution label are considered slightly toxic. If you find them, choose products that are nontoxic enough that they require none of the signal words above on their label. Beside the signal word is usually a phrase that describes the nature of the hazard, such as “may cause skin irritation,” “flammable,” “vapors harmful,” or “may cause burns on contact.” Look for instructions on how to use the product, which may help you avoid injury. Some labels do list active ingredients, which may assist you in detecting caustic or irritating ingredients you may wish to avoid, such as ammonia or sodium hypochlorite. A few manufacturers voluntarily list all ingredients. Beware of unregulated “greenwash” claims on labels! Terms such as “natural” and “eco-friendly” shouldn’t be equated with safety unless they’re backed up with specific ingredient information, such as “solvent-free,” “no petroleum-based ingredients,” “no phosphates,” etc. “Non-toxic” has no official definition, so unless a third party has verified this claim, it is not considered meaningful. And don’t believe “organic” ingredients in cleaning and other chemical products are any safer than other substances. Although “organic” in the grocery store refers to foods grown without synthetic pesticides, in chemistry it refers to chemicals that are carbon-based, including some VOCs (volatile organic compounds) that release harmful fumes and may cause brain damage or cancer. For many home cleaning chores it is safer and cheaper to make your own cleaning and laundry products with items you already have around your home, such as baking soda, white vinegar, lemon juice, hydrogen peroxide, liquid castile soap, borax, cornstarch and Isopropyl alcohol. ← Immigration, a Ticking Time Bomb!